I admit, I have never been one to cook three meals a day. Breakfast was usually something quick like yogurt or fruit, lunch was leftovers or sandwiches, and I would cook a big dinner. Now that we are trying to go gluten free, making sandwiches or burgers isn’t an option. 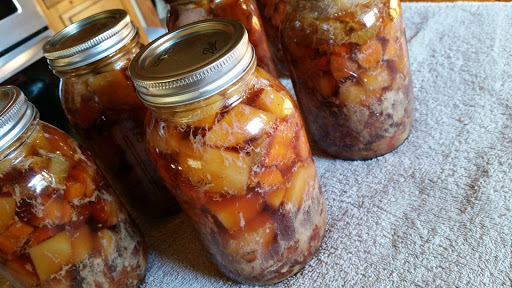 I decided to try canning meals in jars. If I can come up with enough variety, everyone should be able to have their choice of a hot meal. To each quart jar, add 1 tablespoon tomato paste, 1 teaspoon Worcestershire Sauce, and 1/2 pound of stew meat. Divide the potatoes, carrots, onions, garlic, and celery evenly between the jars. You may have to add or remove some of the potatoes or carrots to fill the jar. To this you will add 1/4 teaspoon thyme, 1/2 teaspoon salt, and 1/2 teaspoon pepper. (Those are the quantities I added. You may prefer more or less.) Leave one inch headspace at the top of the jar. Fill the jars with beef stock to one inch headspace. Wipe the rims with a paper towel dipped in vinegar to ensure they are clean and the lids will seal. Place 2 piece lids and process in the pressure canner for 90 minutes. NOTE: I did a raw pack for this batch. Many people cook their meat, add it to their veggies and stock, bring it to a boil for 15 minutes, then pack it into hot jars. Either way, you will still process this in the pressure canner for 90 minutes. Since it is perfectly safe to can each ingredient raw, why go through the extra steps? Just my opinion. Also, if you have never used a pressure canner, PLEASE read the manufacturer’s directions before you attempt to use it. While it is not difficult to use, you want to make sure you are doing it correctly so that you don’t end up with food that could easily spoil. A good beginner book for canning is the Ball Blue Book. It walks you through each step of the process and has many recipes you will want to try. These can be found anywhere canning supplies are sold.